and cook the beef for 5 minutes, stirring often until well browned. 2. Preheat the oven to 220°C, gas mark 7. Line a roasting tin with foil and then with baking parchment. Place the hollowed out tomatoes in the tin. Place the garlic, onion, herbs and cinnamon in a food processor and pulse until finely chopped. Add the cooked beef and pulse until roughly combined. Stir in the pine nuts and the cooked rice then season. 3. 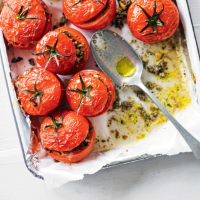 Spoon into the tomatoes and finish with the reserved tomato tops. Roast for 20-30 minutes until piping hot throughout. Serve immediately. Delicious with a dressed spinach salad.